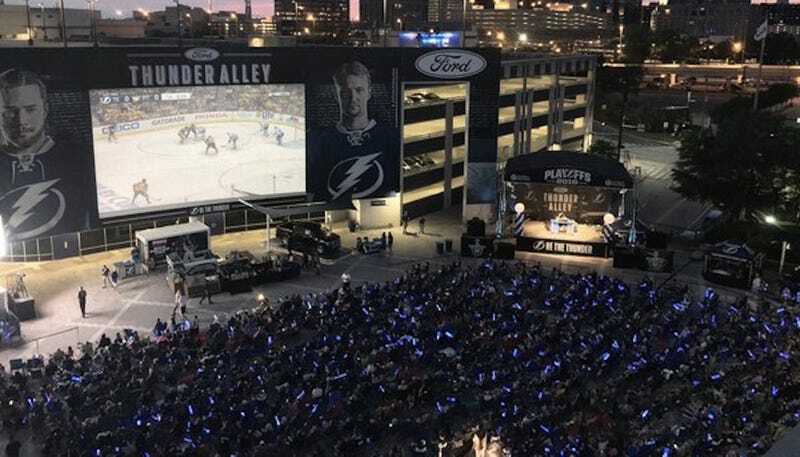 The Tampa Bay Lighting hosted a very well-attended viewing party on Sunday for Game 5 of their Eastern Conference Finals series with Pittsburgh. Thousands went to the public showing (around 8,000 attended an analogous event last year), and the team had planned another official party for tonight’s Game 7, only to cancel it yesterday afternoon and encourage fans to head to a different, unofficial event. The NHL told Deadspin that the Lightning were only allowed to host one official event per series, and that they’d already used up their slot on the Game 5 party. But the Sharks and Blues have each hosted multiple parties during the Western Conference Finals, and sources tell us that the NHL and NBC pressured the team to cancel tonight’s event because of worries about low TV ratings. We’ve also heard the NHL is threatening to fine teams for violating the watch party rule, again at NBC’s behest. The NHL is most likely enforcing this policy with such vigor because of the disastrous TV ratings these playoffs have drawn. Viewership of both Conference Finals matchups are down from last year, especially so in the Western Conference.